My time going abroad was conveniently coinciding with a change in administration in the States. I usually like to joke that I decided to go to Canada to escape a country under a new president I didn’t agree with. While that wasn’t my original intention, it’s probably not far off from the truth. I am standing along the sidelines today, watching the torch of leadership passed and hoping we don’t all burn. I didn’t know how much influence and conversation here would still somehow tie to today’s inauguration and what that might mean for the future of the States and world in general. With such close ties and shared border, there is inevitably a buzz I’ve felt the entire week. Nervous energy. Hesitation and uncertainty. A genuine fear. And we cannot forget when Canada’s immigration website crashed in light of November’s election results. For Canadians, they can be proud to be under an administration that champions concern for human rights and the environment. Rather than prioritizing military power and closing doors to all immigrants, even displaced Syrian refugees, Prime Minister Trudeau is focused on peace-making efforts with the United Nations and fulfilling goals of welcoming 25,000 Syrian refugees into the country. The key points of variance from this day forward are not just an American challenge, but a global one. Policy areas for Canada are at risk of success if key players like America aren’t on board. New pressures in place of agreements are ahead. Canada should also worry about the progress they’ve made. They cannot ignore their southern neighbors. When it comes to trade, security, and international relations, Canada and America have a crucial relationship at stake, one that is only as strong as its weakest link. If this link is unqualified for the issues that arise, everybody suffers the consequences. I am proud to be staying short-term in a country that is lead by a so-called “anti-Trump.” In fact, even Trudeau’s rise to power was described by opponents as inexperienced and solely based on family legacy. Each candidate won through expert branding and loyal voters. 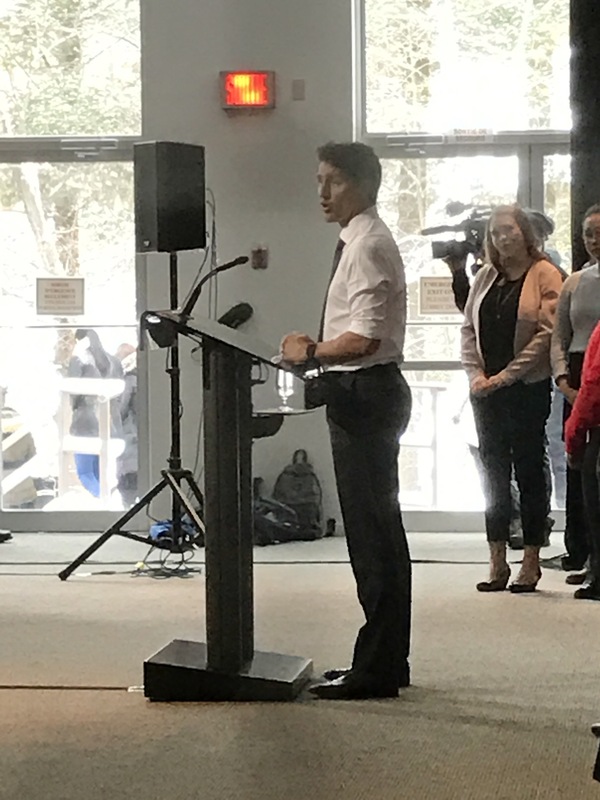 That’s where their similarities end, as Trudeau totes inclusive, forward-thinking ideals, proudly supporting and representing the common people. I was even lucky enough that he visited my campus this past Wednesday morning. I honestly had no idea. I had just stumbled randomly upon a crowd. Security men in suits wearing red pins were surrounding the area. So I waited for what seemed like an eternity to see Trudeau walk down the hallway, hold a press conference & leave. I didn’t see much, but it was enough to be in awe. 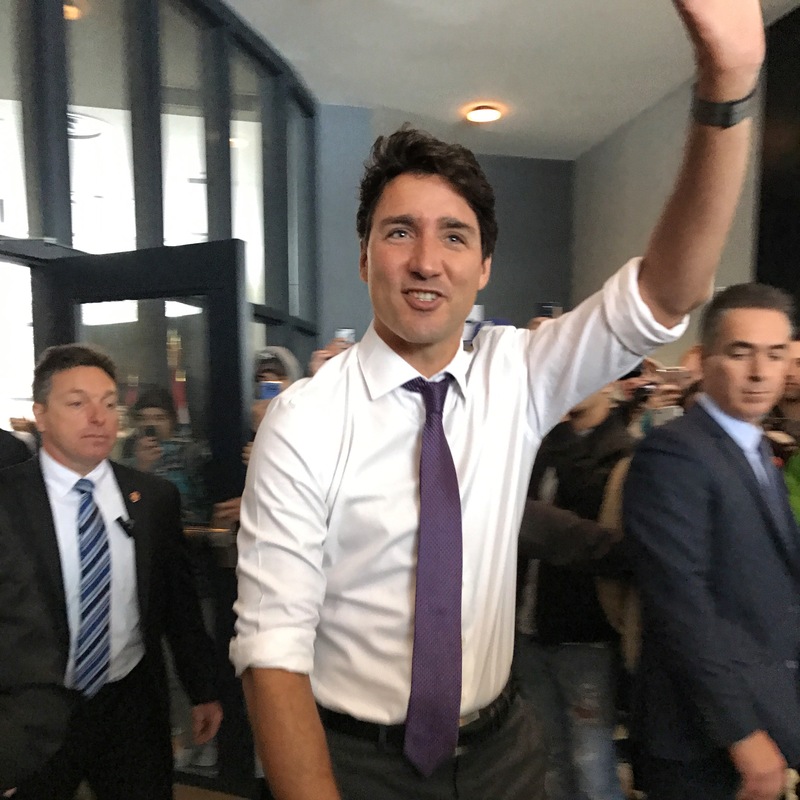 I hadn’t actually expected to see Trudeau while in Canada (it was a running joke with people that I might see him). Less than a week of classes later, and now every other experience will somehow have to compare to this. It’ll be tough to beat. Anyways. As a trying optimist in this situation, I’d like to see a future Trudeau-Trump relationship as one that we as individuals can model. People who might have very different outlooks on the world, but can have productive discussions and can find some common ground. I’m certainly not an expert in diplomacy, but in this case, we have no choice. The polarization of our beliefs now takes the forefront in which we can finally address it. The difference between Canadian and American mentalities feel like polar opposites. Personally, even at a smaller campus, I am fortunate enough to be immersed in a very diverse student body, not to mention welcoming. My bigger home campus is proud of its diversity program, but before I left last semester, it was seeing hate crimes, from racial slurs and direct attacks at minority students. From the conversations I’ve had with a few students here in Canada, we’re on the same page, a hopeful sign we can stand together and fight for what is right. We have to educate ourselves on the facts and make sure our voices are heard. As citizens of our respective countries and the world, that is our responsibility, more important now more than ever. At this point, I hope America looks to Canada for guidance, for a clear example of what it means to show tolerance and respect to every single person, to make the world a better place. Trump is entering his position with some of the lowest satisfaction rates of any president-elect in history, people left and right refusing to even attend the inauguration ceremony. This is only the beginning. In a few months, I will be back in the States, but I will have seen what the first months of the new administration have brought. ACA is already on its way out. Who knows what might be next? Again, I want to be optimistic, but if the president is not worthy of respect, I will continue giving it to every person I meet until they prove otherwise. I will listen with an open mind and heart. I will help those in need, no matter my country.